If you have a cough or you’re wheezing, chances are you reached for Vicks VapoRub to help alleviate your suffering. You probably rub it on your chest to sooth the symptoms of flu and cold, so you can sleep better at night. However, many users are saying this popular ointment actually works better with this technique. Instead of applying it on the chest, you should rub it all over the soles of your feet. The word spread all over Facebook as well as forums all over the Internet. This unorthodox way of using Vicks as treatment for cough also requires you to put on socks after applying the ointment on your feet. You should do this before you go to bed, according to the supporters of this method. They can feel the vapors of the ointment reaching their throat and it really works when you rub this before you go to sleep. But the question remains, is this true or not? Although there are a lot of people who swear this method works for them, there is no scientific evidence as to whether or not it is effective.But this technique is not new. 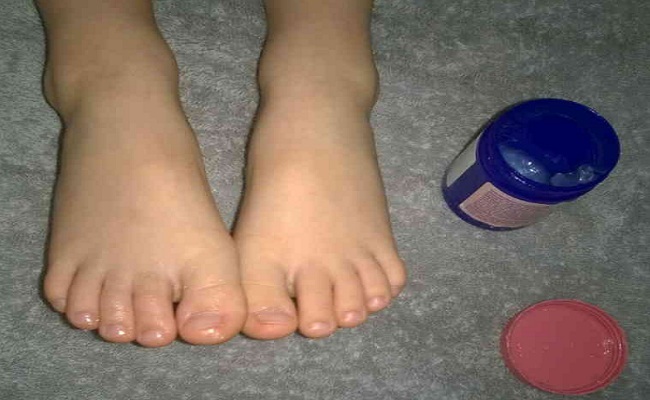 In fact, this advice of applying the mentholated topical cream to the feet and putting on socks before going to bed hit the online world in March of 2007. While some scientists did deny the practice, many people believe this is really a home remedy for cough. It works well with young children, too. How about experts? Dr. Lynne Jordan, a psychologist agrees that this unconventional method may really work in some people due to the fact that it can reduce stress. When stress decreases in a person who is coughing and wheezing, the discomfort may also reduce. But if your child is coughing for several days, you should not completely rely on this ointment. Although some experts may say putting Vicks on your feet may just be a placebo effect, there’s no stopping its supporters.